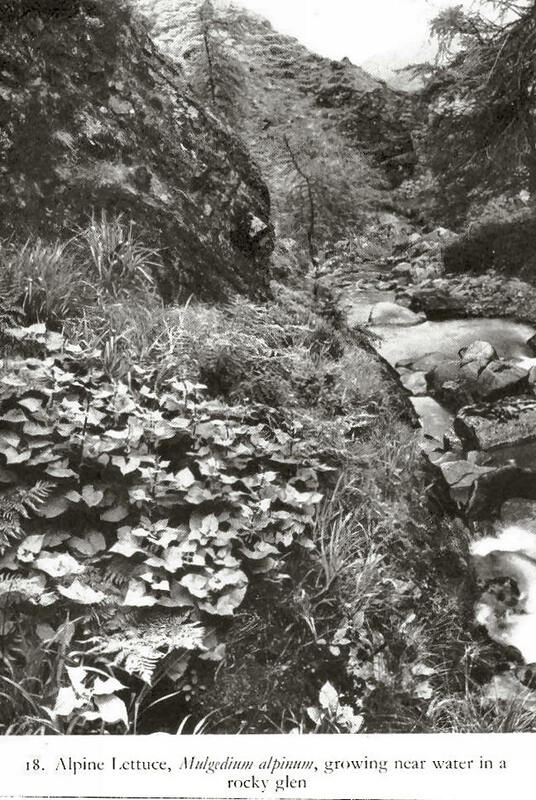 Everyone who has climbed on the higher Scottish mountains must have been struck by the beautiful, green, mossy springs which occur, like oases, among the dry, somber rocks and boulders. The sides of streams and rivulets, so often obscured by rank vegetation in the lowlands, are here delicate green carpets of moss and golden saxifrage, through which the water gurgles or under which it disappears. These areas are delightful spots to explore, for it is here that we shall find many characteristic plants of the mountain pastures, plants which cannot tolerate dryness, but revel in plenty of water at their roots. 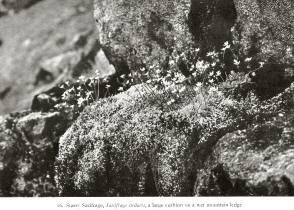 They include the Starry Saxifrage, the Alpine Willow-herbs, the Alpine Stitchwort and several others. Large areas of boggy and marshy land occur in the mountains. The bogs with their peaty soil, will be dealt with in a separate chapter, as they are characteristic of many of the lower areas. The damp pastures, where bog-mosses are not abundant, support a varied population of grasses, rushes and sedges, as well as other plants such as the Alpine Saussurea and the Alpine Willows. The peaty soil of the bogs and moorlands is not so evident in these areas, where owing to the slope and hence the better drainage, the water tends to be running rather than stagnant and the soil less waterlogged than the typical bog lands. I first made the acquaintance of this beautiful saxifrage at the head of Glen Nevis, where I have found many interesting mountain plants. A small waterfall came tumbling down the steep mountain side, dashing itself against rocks and boulders in clouds of spray as it rushed down from the springs near the summit of Ben Nevis. I climbed up beside this glistening cascade, where my eye was caught by several bright golden patches at the water’s edge. Scrambling down I found that the patches were several large tufts of the Yellow Mountain Saxifrage, their leaves bedewed with spray. They grew out of the damp rocks and hung down their face, forming a perfect, natural, rock garden. It has a short stock, covered in the old leaves of past years. From this stock arise, or rather descend, several flowering stems which may attain six inches, or even more, in luxuriant specimens. They are clothed in rather thick, deep green, ovate leaves which are very seldom toothed or lobed. They are surmounted by a panicle of five to perhaps a dozen or more beautiful, golden yellow flowers. If we study the flowers, we shall find that they appear to have ten petals. This is because the sepals are about the dame length as the petals and are of the same golden colour. This is another device to make the plant more conspicuous. AT the base of each petal is a deep yellow spot and it is here that the nectaries are situated. The anthers are bright red. It is quite a common plant in the Highlands, and one can be almost sure of finding it among damp rocks and beside streams and springs. 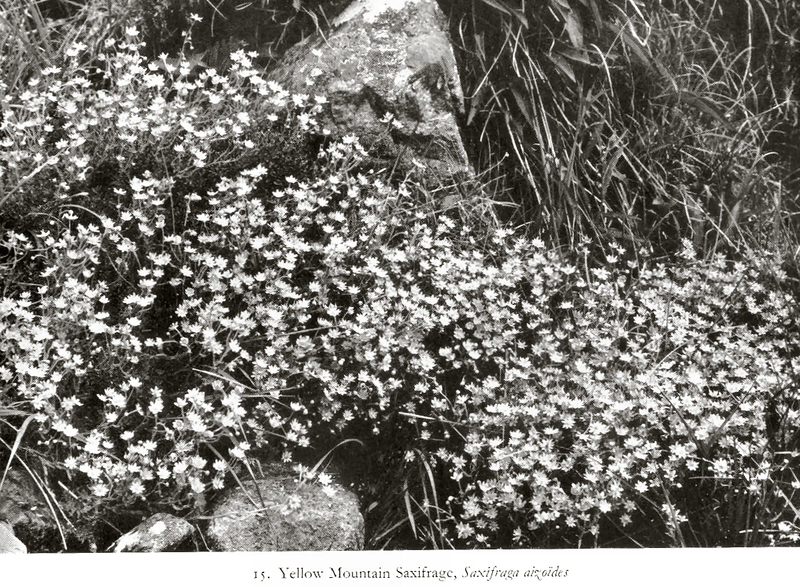 It does not attain such high altitudes as most of the alpine saxifrages. This plant is a typical, rosette saxifrage (see p. 18) and is quite unlike S. aizoides and S. hypnoides in habit. The short main stock is crowned by a rosette of egg-shaped leaves, which are of rather a thin texture and are usually toothed near the apex. They are not pressed close to the ground as in many rosette plants, but are semi-erect. As this plant lives in bogs and springs, this upward tendency probably keeps the under surface, with its vital breathing pores, from becoming waterlogged. Each rosette sends up a fine, flowering shoot which is bare of leaves. It is surmounted by a panicle of small, white flowers; each one is exactly like a bright star and is very conspicuous. Two yellow spots are found near the base of each petal and act as honey guides. This little plant loves the bogs, springs and damp places of the mountain sides and attains considerable elevations. It is common on our Scottish mountains above 2,000 feet. This plant forms dense tufts of green leaves from which spring the flower stalks. The stock is covered by the brown, dead leaves of past seasons, and sends out many creeping branches which are fairly long when terminated by the flower stem; or short, when barren. The branches are covered with many small leaves which are usually three-lobed. The barren shoots form dense tufts of leaves, but bear no flowers. The flower stems are tall and devoid of leaves and are surmounted by several large, white flowers. 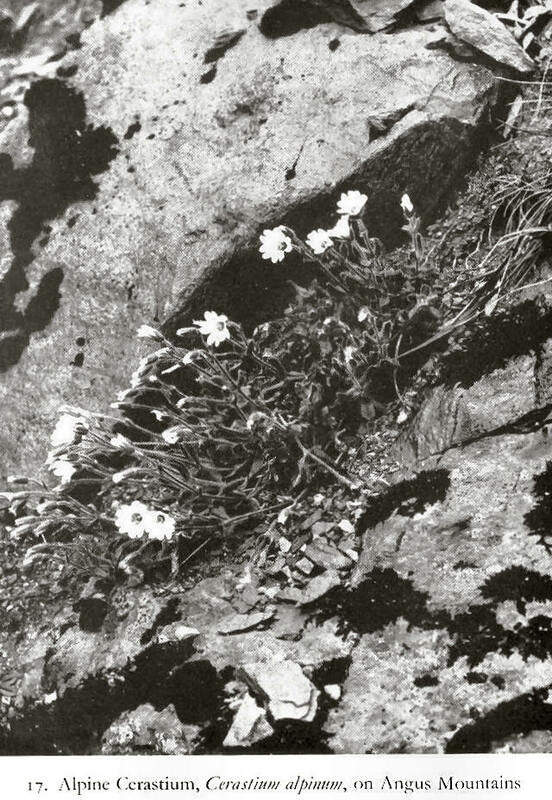 This plant varies greatly and at high altitudes becomes very tufted, the flowers becoming smaller and the whole plant much more like S. caespitosa (see p 17), which some authorities think is a high alpine variety of S. hypnoides. The willow-herbs are very common plant throughout the whole of Britain, and in the Highlands such species as the Rose-bay and the Hairy Willow-herb are to be found in the glens and lower regions. Two species, however, are confined to the high mountain pastures of the Highlands; they are the Chickweed-leaved Willow-herb (Epilobium alsinefolium) and the Alpine Willow-herb (Epilobium alpinum). They are usually found along the edges of brooks and streams and in wet places at altitudes of from 2,000 to 3,000 feet. They are both very common in the Highlands, although often overlooked, as they are by no mean conspicuous. The Alpine Willow-herb is a small, little branched plant with a creeping rootstock which sends up short leafy stems in the autumn; these are called scions or offsets. These scions survive the winter and form the new flowering plant of the following year; they are rather long and slender and are covered with small leaves. The flowering plant is often branched at the base, but each stem is unbranched and attains four to five inches in length, running close to the ground and only becoming erect towards the extremity, where it produces a raceme of flowers which is often reduced to one or two solitary blooms. The stems are covered with small, glabrous leaves. The flowers are large in comparison to the size of the plat and terminate the long cylindrical ovary, which is about one inch in length. They consist of four pinkish petals which are inserted on the calyx tube and in which are included the stamens and stigmas. Nectar is secreted on the summit of the ovary and as the anthers mature before the club-shaped stigmas, self-fertilization is impossible. Small bees are the chief visitors. In the autumn when the flowers have faded, the long ovary splits and liberates the seeds which are terminated by a tuft of long, silky hairs. These hairs support the seed and it sails along in the wind for long distances. For this reason the Alpine Willow-herb is a widely distributed and common plant. The Chickweed-leaved Willow-herb is a more luxuriant plant than the preceding, being much more branched and covered in larger, ovate, toothed leaves. The flowers are also larger and arranged in leafy racemes. The offsets are often underground, consisting of bud-like swellings. The seeds are distributed as in the preceding. 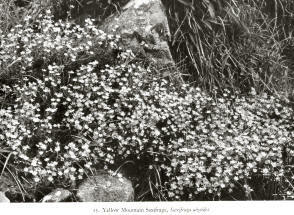 Around the green, mossy springs of the high mountain sides, one may often come across the delicate, bright green, cushion-like tufts of the Alpine Stitchwort (Cerastium cerastoides), starred with pure white flowers, especially if one is climbing among the higher mountains of Breadalban, Lochaber, or the far north. It is a beautiful little plant with its intricately entwined, short, perennial stems covered with tiny, opposite leaves of a bright, shiny green, washed continually by the spray of the tumbling torrents by which it loves to dwell. The cushion-like tuft survives the long, hard winter beneath the snow. IN the spring the cushion send sup many weak flowering ste,s which produce tow or three pairs of small, opposite leaves and are terminated by one or two large, white flowers. As in the case of the Moss Campion, this cushion arrangement with its many flowering stems makes the flowers much more conspicuous than they would otherwise be. The flower consists of five cleft petals surrounded by an equal number of sepals, which are only half as long. It secretes much nectar and the glistening drops are plainly visible. The ten stamens shed their pollen one by one before the three styles have matured. The chief visitors are flies, small bees and thrips. The seeds, being very small and light, are blown to a considerable distance by the winter gales. This is another very common plant of the damp mountain pastures. It is usually found in less moist situation than the Alpine Stitchwort, such as grassy pastures, damp screes and clefts in damp rocks. Like the preceding it has a loose, cushion-like tuft of perennial stems covered with small leaves, which in some varieties are almost glabrous, and in other are covered with a thick woolly coat of hairs which protect the plant against cold and drought. The tuft sends up many short, flowering stems, which are clothed by three or four pairs of oval opposite leaves. Each stalk is terminated by a single large, conspicuously white flower, much like that of the Alpine Stitchwort, but larger. The flower is similarly pollinated. The mountain pastures are the home of many species of willows which are more or less adapted to high, exposed situations and damp or west conditions. They have not become so typically alpine in their habit as the high alpine willows (Salix herbacea) and (Salix retuculata) (see p. 22). I do not intend to describe the many varieties and hybrids to be found on the Scottish mountains, but simply the main forms from which most of them are derived. Anyone wanting more detailed descriptions of this numerous and difficult genus must refer to one of the many monographs which have been written. The main species to be found in the Scottish mountain pastures are the Tea-leaved Willow (S. phylicifolia), which is fairly widely distributed in the Highlands, the Downy Willow (S. Lapponum), a much rarer plant confined to higher altitudes than the preceding, the Woolly Willow (S. lanata), confined to a few high, rocky glens, and the Whortle Willow (S. Myrsinites), confined to higher mountain pastures. Unlike the tall, often tree-like willows of the lowlands, the mountain willows are rarely more than shrubs, and in exposed situations are often closely procumbent to the soil, especially the Whortle Willow, but attaining two or three feet when grown in sheltered spots. A close examination of various types of S. phylicifolia and S. Myrsinites show that they merge almost imperceptibly into one another, so that the latter may indeed be only a high mountain variety of the former. They agree in having ovate leaves (although the commoner forms of S. Myrsinites have orbicular leaves) which, while they are silkily hairy when young, become devoid of hairs on the young leaves probably protect their tender tissues from frost and damp. The catkins of S. phylicifolia are slender, rarely an inch in length. The males are without stalks, but the females are on short, almost leafy stalks. They are rather silky. IN the case of S. Myrsinites the catkins, both male and female, are produced on short, leafy stalks and are also silky. We can find S. phylicifolia along the edges of streams and in damp hollows, which give some shelter from the wind, at considerable altitudes. As we ascend it is gradually replaced by S. Myrsinites which is confined to the higher pastures. The other two species, S. lanata and S. Lapponum, differ from the preceding by being thickly covered with hairs at maturity. They are stout, bushy, shrubs to be found in rocky places at high elevations and are definitely Arctic types. The former has leaves which are thickly covered on both sides with dense, silky hairs which are very beautiful, and make a complete protection against the drought, damp and cold. In the latter the coat is much thinner and is composed of a cottony down. Its catkins are covered with long, silky hairs and are an inch in length, becoming nearly two inches in length after flowering. Thos of S. lanata are very beautiful objects, being covered with long, silky, golden hairs and being nearly one and a half inches in length. After flowering the females attain a length of three inches. As we have already remarked these descriptions apply in a general fashion only, each species giving rise to so many varieties and hybridizing so freely with each other that definite identification is almost impossible. They are interesting in composing a part of the special mountain flora of the Scottish Highlands and an interesting collection may be made showing the gradation of varieties from one particular species to another. This plant belongs to the same family as the lowland Docks and Sorrels and is quite a common plant in the damper portions of our higher mountain pastures. It is noticeable because of its rosette of smooth, dark green, kidney-shaped, radical leaves which terminate a long leaf stalk. The rosette sends up a slender, leafless, flowering stem which is terminated by a branched raceme of many, small, greenish flowers. The flowers possess no conspicuous petals or sepals as do most alpine flowers. They are visited by flies for the sake of their pollen (as they secrete no nectar) and so cross-pollination may be effected by them. Wind pollination is probably the plant’s surest means of cross-fertilization. This a quite a common plant in damp pastured at fairly high altitudes throughout the Highlands. It belong to the Ranunculus Family, of which several plants such as the Marsh Marigold, Wood Anemone and Glove Flower are found in various situations, but the Alpine Meadow-rue is the only species in the British flora found at high altitudes. It is a dainty plant with its beautifully-cut leaves and delicate flowering system. The leaves are mostly radical, each stalk being divided into three or five branches which are clothed with small, roundish, glabrous leaflets. From the midst of the leaf stalks arises the simple, leafless flower stalk, which is usually four to six inches high and terminated by a few drooping flowers. The flowers possess a small, yellowish calyx, but have no petals, the numerous long, golden stamens being the flower’s chief advertisement. Flies and pollen-seeking bees visit the flowers for the pollen so liberally provided (no nectar is secreted), but it is probable that the plant is more dependent on wind pollination. The long stamens, projecting well beyond the calyx, support this view, as in this position they are exposed to the wind, which blows the pollen from the anthers to fall upon the receptive stigmas of nearby plants. When the weather is wet and there is danger of the pollen in the exposed anthers becoming wet and useless, the anthers close and so protect the precious dust. This is quite a common plant in damp pastures at fairly high altitudes throughout the Highlands. It belongs to the Ranunculus Family, of which several plants such as the Marsh Marigold, Wood Anemone and Globe Flower are found in various situations, but the Alpine Meadow-rue is the only species in the British flora found at high altitudes. This beautiful plant of the higher, damp mountain pastures is a member of the great Composite Family, and is closely related to the knapweeds and saw-wort of our lowland meadows. Like most composites it is a perennial with a deep-striking tap-root which gives rise to a stout stem about one foot high. It produces several large ovate leaves, which are a shiny green above, but are covered with a thick white, cottony down beneath, which wears off with age. This down serves the dual purpose of saving the pores from becoming waterlogged in wet weather and of protecting the leaves from excess transpiration in times of drought, which on the high mountain sides can be very severe. The stem and involucres are also covered in down. In a few secluded spots, beside crystal springs and streams high up in the mountains of Clova and near the summit of Lochnager, we can find one of our most beautiful and rare mountain plants. It prefers the sheltered corries to the open hillside, and this is quite natural when one considers that it may be as much as three feet high and bears large leaves; the wind of the exposed mountains would soon beat it down and destroy its beauty. It possesses a large tap-root which stores up food material during the summer and allows the plat to pass the winter safely beneath the snow. >From the stock arise several large, spreading, smooth, green leaves which are almost succulent and in which the upper love is very broad and large. The flowering stems may be over three feet high and are clothed with similar leaves which, however, diminish in size as the summit of the stem is approached. The upper part of this stem is covered with glandular hairs which prevent creeping insect from reaching the flower heads. The stem is unbranched and produces a long, narrow panicle (which is almost a raceme) of several heads of beautiful, deep-blue flowers. The involucre is narrow and consists of a few small, imbricate bracts. Each head consists of twelve to twenty deep-blue, strap-shaped florets which are arranged similarly to those of the Common Sow-thistle, so common as a garden weed. The seed is surmounted by a dirty-white pappus of long, stiff hairs which form an admirable parachute. The flowers are visited by bees who are attracted by the deep-blue florets and the corolla tubes full of nectar. This is a rather strange little plant, as firstly it is an annual (annuals are very rare in mountain floras), and secondly it loves the wet, stony sides of streams and springs, whilst all the other members of this family love dry, stony places. It possesses small erect stems covered with fleshy, cylindrical leaves, which are usually scattered along the stems. The stem is terminated by a few small flowers, which have five dingy-pink or lilac petals. The flowers are not at all conspicuous and are probably self-fertilized. Insect do visit them occasionally, however, and nectar is secreted so that some cross-fertilized seed may be produced. The upper stem is covered with short, viscid hairs which form a fence against creeping insect. This is not a common plant in the Highlands, being confined to the area south of the Caledonian Canal. This very handsome species is one of our most beautiful thistles, and it is a unique experience to climb up into a grassy corrie and find a colony of these large, dignified plants, their large head of purple flowers contrasting beautifully with the white, cottony stems and the bright, shiny, upper surfaces of the leaves. Its rootstock is perennial and creeping so that the plants spread, once established, and soon form colonies. They give rise to tall, stout and deeply-furrowed stems, which are often four feet tall in sheltered spots, and are covered with white, cottony wool. The leaves are very large and embrace the stem by two small auricles. They are lanceolate and bordered by very small teeth which, however, are not spinous as in most other thistles. The upper surface is green and shiny, but the under surface is thickly covered with white hairs. These prevent the stomata from being blocked by moisture arising from the wet soil the plants inhabit. The stem is terminated by a large head nearly two inches in width. Its involucre consists of glabrous lanceolate bracts which are not armed with spines. The flowers are pollinated by humble-bees as described under the Spear Thistle (see Chap. XXI). As in the case of that plant, the seeds possess large parachutes which carry them long distances over the mountain sides.